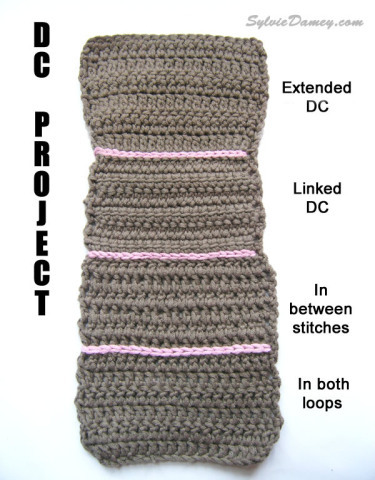 Let’s start our sampler with 6 rows of DC in both loops as a reference to compare the other stitches to. You have now 6 rows of dc in both loops. Mark last row of dc in back loop with a stitch marker. To work this first variation of the dc, let’s insert the hook NOT under both legs of the V sitting at top of each st, but BETWEEN the posts of the dc in previous row. Side note – If you have a look at the Wrong Side of work, you’ll see that working in between stitches creates bulkiness over the base of stitches: when working between the posts of row below, you actually encapsulate all 3 strands of yarn together. To me, it nearly looks like weaving… What do you think ? To end row, make sure you don’t miss the last st: insert hook between last-but-one post and last post from row below. Continue likewise for the next 5 rows. You end up with 6 rows total of DC in between stitches. Mark last row of dc in between stitches with a stitch marker. We are now going to make Double Crochets which are, as indicated by their name, linked together. With this stitch, there will be hardly any gap in between the stitches. In order to achieve this, we’ll “replace” the very first yarnover by a slip stitch in one area of the previous dc. This will link together the stitches, as if the Double Crochets were holding hands tightly. And work a slip stitch. You have 2 loops on hook. Important : This slip stitch will “replace” the initial yarnover of next dc ! Now to start the 3rd linked dc: Watch closely the linked dc just worked. Can you see the horizontal bar about halfway up ? and repeat from ** to make the next linked dc. You now have 3 linked double crochets. And make sure you work the last st in top of the chain 3 from row below, at the end of row. Repeat until you have 6 rows total. Mark last row of linked dc with a stitch marker. I don’t know about you… but to me, this nearly looks like crocheting 2 rows of single crochet in 1 row of double crochet. Weird, right ? To count the rows, I refered to the horizontal line halfway up the row, on the Right Side. yarnover and pull through last 2 loops. ** You have finished your first extended dc. Repeat from * to ** across row. Continue to work in extended dc until you have a total of 6 rows. Now. Those extended double crochets look quite similar to regular dc (= in both loops) except that they’re taller. I don’t know about you, but I’ve been wondering: how tall are those ? Taller than Treble Crochets ? Pfew ! Treble crochets remain taller than extended dc. This may be a good thing to remember, when working a panel of stitches of different heights (like I did for the Loup jacket, or the Babouches for instance…): In between the Double and Treble crochet stitches, the extended dc fits just nicely ! Bravo, you’ve now finished this fourth sampler ! Just as we did for the other samplers, let’s separate each section by a line of surface crochet, using the stitch markers to visualize where to stitch. Finally, admire your sampler ! Can you spot any difference between all those variations of the dc, or decide which best use could be applied to each variation ? Now it’s your turn: share your pictures of your sampler so I can add them in the Collective Album on my Facebook page ! See you next week to share our conclusions on the stitches from this Episode ! Only just found this but I am definitely going to do these tutorials. They are fantastic and thank you very much for sharing these.